In an exciting mid-week battle, IM Justin Sarkar played a two game match against NM Daniel Lowinger and Al Pinto played a three game match against Wendy Cummings. 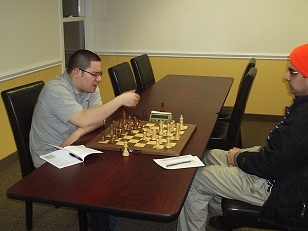 In the first match, Sarkar and Lowinger entered and extremely complex middle-game. Sarkar managed to reach what seemed like a winning endgame, but Lowinger put up firm resistance and in the time scramble the game ended in a draw. The second game ended in a quick draw and the match was tied at 1-1! Meanwhile, Cummings won her match with a round to spare, winning the first two games! Although visibly frustrated, Pinto fought on and recovered just in time to win the final game.